Recipe: Mom’s Deep Fried Meatballs – Agnes' Sanctuary. A journey to inspire. It started with my interest in baking, and later cooking, that my mom trained me in the kitchen. The first thing I learned was how to peel garlic and shallot then mush it with mortar and pestles, which could easily took an hour of my time. Silly it was but I learned how ingredients were mixed and how to create flavor full of spices. My mom’s Deep Fried Meatballs seemed to be the one thing that always shone on every family event. Be it Christmas, Chinese New Year, birthdays, or just a gathering, everyone would ask for the meatballs. What’s so special about it? Maybe because crunchy outside and savory flavor inside. I decided to write the recipe on my blog, per my mom’s permission, so that everyone can also try it on their own. The recipe consists of the making of spices and the making of meatballs batter. My mom usually make a large batch of spices and refrigerated it for quite a long time. I believe we can store it for up to a year, with note that it always have to be refrigerated. You will see later that we will only use a few spoonful of this spices on the meatballs batter. Soak the whole dried squid in tepid water, slightly tap with paper towel to dry it or let it air dry for a while. Take out the wooden pick below the tentacles, if any. Slice it thinly, and stir fry with oil. Use about 2-3 tablespoon for 1 whole squid. Would be best to use bigger squid averaged around 12 inches. Fry until a little crispy and browned. Take it out and let it cold. 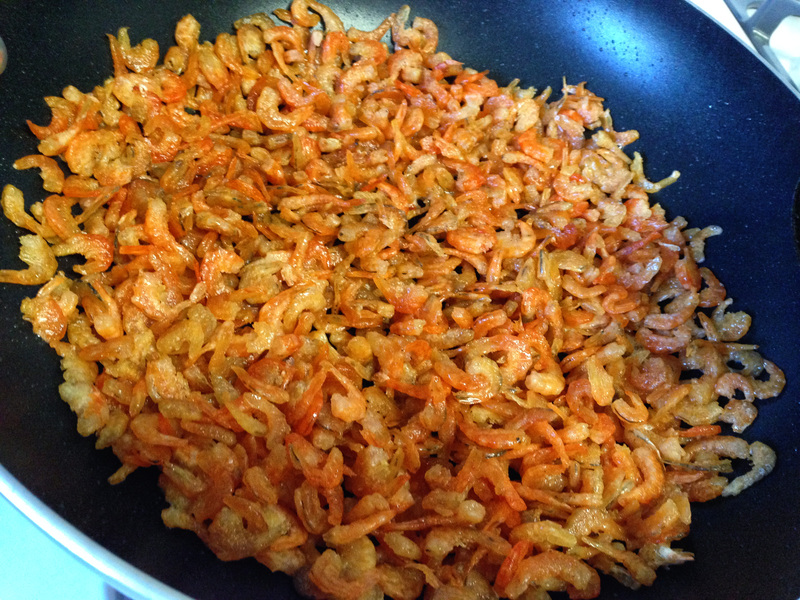 Using the same pan, fry the dried shrimp using leftover oil. Add more oil if needed, but don’t make it soaked in oil. Fry until smells good, browned, and crispy. Take it out and let it cold. Peel the garlic and shallots, make sure both ratios are equal (use your feeling if using big shallots like mostly sold in USA). Mush both garlic and shallot with mortar and pestles like old times but makes sure it’s not pureed (I used hand blender and it came too mushy). 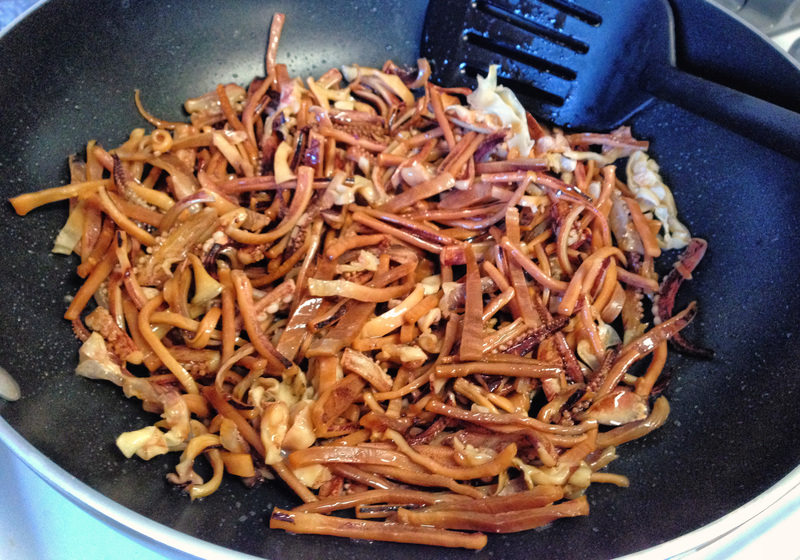 Using the same pan from dried squid and shrimp, fry the garlic-shallot mixture. Make sure there’s just enough oil as if stir frying garlic. Fry until it smells good and just slightly creamed color. When fried squid and shrimp are cold, chopped them one by one or altogether in a blender, or with hand blender until smooth grained. When the garlic-shallots are cold, blend it together with crushed fried squid and shrimp until it reaches small grained texture. The smoother the better. 3 Recipes of Spices makes about 7 cups. Minced pork loin with cleaver until almost ground-like, add the shrimp and minced it together with the pork until well blended. Don’t let the shrimp get too grounded so you can actually have a little bite of the shrimp. Put it in a deep bowl and mix all of the eggs, cornstarch and Meatballs Spices together. Blend them with hand, make sure the cornstarch are well blended into the batter because they can get clumpy. Heat oil in a wok or deep fryer, enough cover the meatballs. Take a batter with your hand and squeeze the batter out between your thumb and index finger, making a round shape batter. Scoop it with spoon and drop it to the wok or deep fryer. Might need some practice until you can reach perfect round shape through the fingers or you can use your own method in shaping the meatballs, but my mom always told me it’s the only way and I found out it’s the best way. A regular sized wok would probably fit 25 to 30 meatballs. Make sure you have space to flip them around. Fry until it’s golden, take it out and strained the oil. Note: The color would be darker once cooled, so make sure don’t fry it until it’s darker gold. You might want to try fry one and see if the consistency is to your liking. The first time I made it in USA is using Argo Cornstarch Flour, and the meatballs came out too hard than usual when I made it in Indonesia. I added 2 eggs for half the recipe, making the batter softer and more liquify. The end result is a soft gooey inside and crispy outside meatballs. You just have to try it 🙂 Let me know if you have any question or change things up a bit! I want to know how this recipe turns out in other people’s kitchen 😉 Enjoy! Next How Meaningful is Your Life? So the 3x spices recipes (equal 7 cups), can be used for approx 20 meatball recipes (as u only use 6 tbs/recipe?). Is that right? And we can store that un a fride for a year. Need to find out – where to buy dry squid in Sydney. Can’t u fry the squid and ebi at the same time? Generally, 1 cup is about 16 tablespoon (US sizes). So yes, the amount that I made which is 3 recipes of spices can make approximately 18 to 20 meatballs recipe. From my family experience we can store it for up to a year or more. If the color, texture, or smell changes then maybe it’s time to make a new one despite of how long it has been stored. You should not fry the squid and ebi at the same time because they probably will not be cooked thoroughly at the same time. Unfortunately I won’t be able to answer where to buy dried squid in Sydney. Although you may want to ask around for a local asian market. I have no luck finding it online, but you may also want to try finding dried cuttlefish, if it may broaden the search.